One of the few titles that remained relatively unchanged in the reboot. Damien is still Robin and pretty much a brat. Bruce is still Batman and still his usual brooding self. And if you’re one of the few who have been living under a rock in past decade writer Peter J. Tomasi (Nightwing and Green Lantern Corps) ties in the Batman mythos origins quite nicely with their murder in Gotham’s Crime Alley. This first issue is also a major turning point for Bruce Wayne as he has finally decided to stop mourning the death of his parents and instead moved on to celebrate their lives. Now before all you fan boys begin to worry that Batman is going to become more of a nicer cuddlier caped crusader don’t you worry, he’s still the same dark knight kicking the asses of the scum of Gotham. Artist Patrick Gleason (Robin and Green Lantern Corps) is still delivering high quality work here with beautifully clean details and awesome action scenes that we’ve come to expect. In this first issue we’re also introduced to a new villain lurking in the shadows (as they usually do). His agenda soon becomes clear as his goal is to ‘erase’ all the Batmen of the world (from the Batman Inc. storyline). And when I say erase I mean dip them in a solution until not a trace of them exists anymore. Just from the final panel cliff hanger I can’t wait until the big reveal. 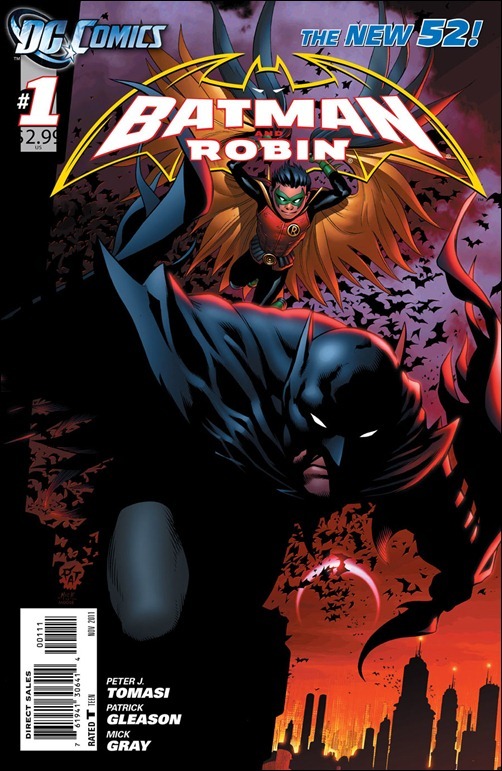 It looks like this Batman and Robin title is going to mainly deal with the ramification from the Batman Inc arc. So if you were a fan of the story arc or a Batman fan in general be sure to pick this title up. I can’t say that I was really looking forward to this title as Swampy didn’t exactly come back to the DC scene the way I was hoping for in the ‘Brightest Day Aftermath: Search for Swamp Thing’. In fact that debacle was painful and a lucid nightmare that I wish I could have forgotten. Which was a shame as his run in the Vertigo line was pretty epic. So imagine by surprise when I picked this title up and found it NOT to be such a let down that I was expecting. Mr. Scott Snyder (American Vampire and Detective Comics) my hat is off to you sir! But my MVP trophy here would have to go to the talents of artist Yanick Paquette (Batman Inc. and Seven Soliders: Bulleteer). He has gone above and beyond what I was expecting has he has delivered some of the most amazing imagery this comic book geek has seen in a long time. I just absolutely loved his organic looking layouts especially in the last few pages. 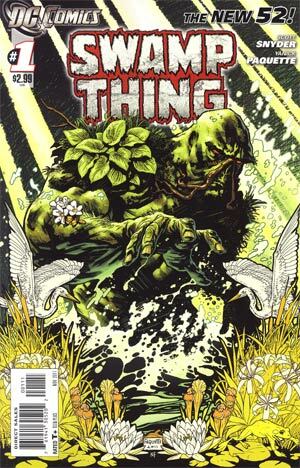 In this first issue fans are presented with Alec Holland newly back from the dead with the memories of Swamp Thing. Holland has not gone back to his roots (pardon by pun) and instead have decided to find himself working as a construction worker. But it seems that the Green is not done with him yet as we see life all around the DCU has gone haywire. What’s next for Holland? Well it looks like his ties with Swamp Thing is not quite severed yet. With the new 52 relaunch the universes of DC, Vertigo, and Wildstorm has all merged into one. I can’t say I’m the best here at explaining Stormwatch as I never was a big Wildstorm fanboy. 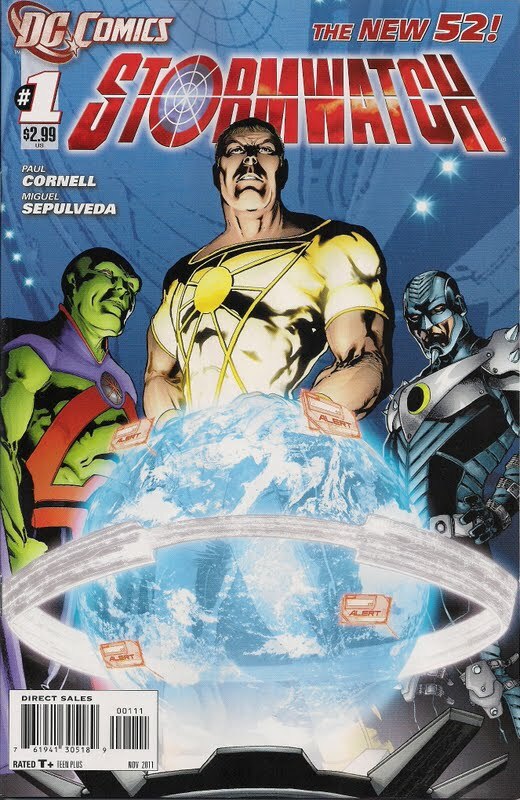 From what I was able to gather Stormwatch is a group of metahumans who has protected Earth from extraterrestrial threads for hundreds of years from the shadows (kind of a Men in Black organization meets the Justice League). From my research it looks like DC is giving Stormwatch a total reboot, especially with characters Apollo and Midnighter who were prominent characters from the original series. DC fans are treated here with a familiar face in that of the J’onn J’onzz Martian Man Hunter who is now serving on the Stormwatch team. I can see what writer Paul Cornell is doing here in the first issue rather than explain the entire back story of Stormwatch he’ll be peppering in information throughout the series we’ll experience it through Apollo’s eyes. Artist Miguel Sepulveda does a decent job here especially in the action scenes, but largely I remain unimpressed. Pick this title up if you were a fan of Stormwatch or curious to see how this organization fits in with the DC universe. Taking over for Greg Rucka on Batwoman in this 52 reboot title are Haden Blackman (Star Wars: Republic and Star Wars Jango Fett: Open Seasons) and J.H. Williams III (Robin and Detective Comics). I was especially looking forward to this title as I’ve been a fan of Williams since his run on Batman. 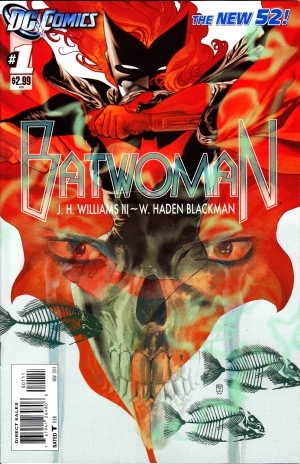 And if you were a fan of the prereboot of Batwoman then worry not as you’re in good hands with Blackman and Williams. Since we last saw Kate Kane she has been making a name for herself as Batwoman and now with protégé Bette Kane the former Flamebird. Kate has burned Bette’s old Flamebird costume claiming by doing so will give Bette a fresh new start. Meanwhile Kate’s relationship with her father continues to deteriorate. If that wasn’t enough Kate as Batwoman has now a new mystery to solve in the form of a villain by the name of the Weeping Woman from a folktale who is kidnapping the children of Gotham. Blackman and Williams do a terrific job here with this title covering everything from Kate’s relationship out of costume (or as she puts it uniform) and in costume. I strongly urge all you Batfans out there to pick this title up, you won’t be disappointed. Get out your D20’s, have a six pack of mountain dew ready, and get those dungeon maps ready because we’re going to wrap up this report with DC’s Demon Knights #1. If you’re a dungeons and dragons fan or high fantasy nerd I think you’re going to like this title. Writer Paul Cornell (Doctor Who and Knight and Square) partners up the Demon Etrigan with Madame Xanadu in a sword and sorcery version of the dark ages. Fans are also treated to other characters from the DCU in this medieval reboot such as the Shining Knight or a barbarian Vandal Savage (who seems uncharacteristically jolly). It’s quite an interesting sight to see and if anything curiosity will keep me buying more issues of this title. The team of Diogenes Neves (Green Arrow and Justice League: The Rise and Fall) and Oclair Albert (Green lantern and Brightest Day) brings us the art for Demon Knights #1 which is quite some impressive work. The duo delivers solid art, good details on the backgrounds, and I absolutely loved the tavern brawl scene. It was as if it was a scene right out of one of RA Salvatore’s D&D novels. If you’re looking for the guilty pleasures of some high fantasy knights and wizards with a dose of DCU than be sure to pick this title up. 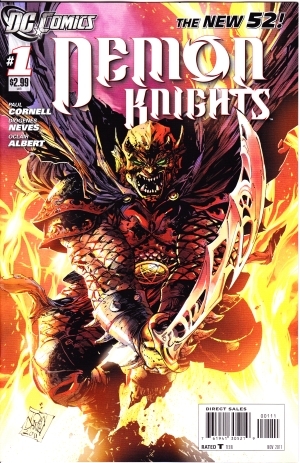 Demon Knights was a huge surprise for me but a pleasant one so here’s hoping for a just as interesting issue two.